I met very lovely people at this Fashion Week and I'm truly happy to have attended every single day! I apolagize if I don't remember some names because I have a gold fish memory.... but I do recall that they were all amazingly stylish fellows! I met him at my first show and he seriously caught my attention with this neon necklace. While browsing around the cocktail area I got strike when I saw this beautiful girl wearing this inspired Dolce Gabbana outfit... I HAD to take a picture of her!!! Dolce & Gabbana's winter 2012 collection is my ultimate favourite collection... and this girl seriously pulled it off! This young fashion design student caught my eye with his custom studded shirt...I simply fell in love with this detail... It had that surprise touch! I really loved her outfit because it was semi casual and semi classy! This wool blazer reminiscent to a Chanel jacket with these washed jeans and a simple white top were a perfect equation for a relaxed yet fashion forward look. I saw her taking steet styles pictures and watching her take place to take a shot I noticed her beautiful necklace! Her skull diamonded necklace seriously caught my attention! Her casual and a bit bohemian look with a touch of bling was an outstanding combination and it was a pleasure meeting another fabulous blogger! While walking around and waiting for the next show... I got caught by watching these two ladies chit chat and I simply had the duty to take a shot of their rocky chic style! I loved the way they combined their feminine side such as a delicate silk black top and these floral pants with these leather biker jackets! When I saw this girl I thought she was one of the models from the runwat because she is quite tall and obviously gorgeous but she's not...Her black Chanel purse caught my eye and I simply loved the combination of her snake patterned pants with a denim top layered with a leather jacket... Just a lovely outfit! 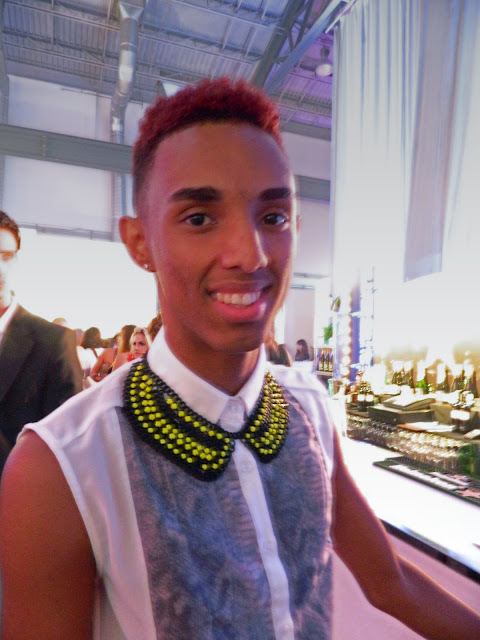 I'm sure you'll be seeing him around more in Montreal's fashion scene!